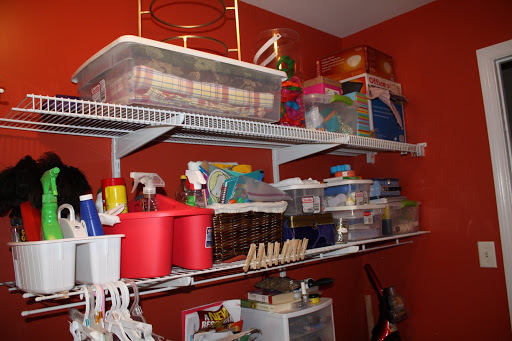 I am trying to tackle several organizational projects this summer. 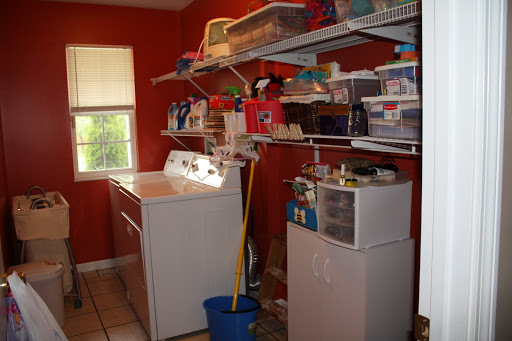 The biggest one by far was my laundry room. It was SCARY (and a little embarrassing) – seriously. My mom has said that it was an accident waiting to happen. It was so bad that when our babysitter came over, I would tell her that after she changes Daphne’s cloth diaper to put it outside the laundry room door. Notice that there isn’t much of a path for walking. I literally had to step over things (often tripping) to get to the washer and dryer. Things on the floor just piled up higher and higher! Things also just piled up on the shelves. Looking for something could be quite catastrophic! Things usually fell to the floor and I usually never ended up finding what I was looking for. Now I can actually see what is on the shelves. Novel idea, I know. 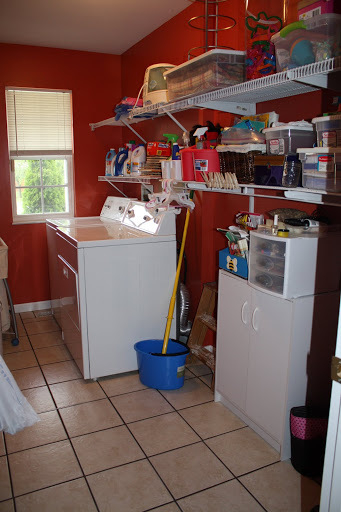 I can walk to my washer and dryer without tripping!! I can do laundry without standing on things!! I don’t think the floor has been this clear since we moved in!! Hopefully I can keep it clean!! 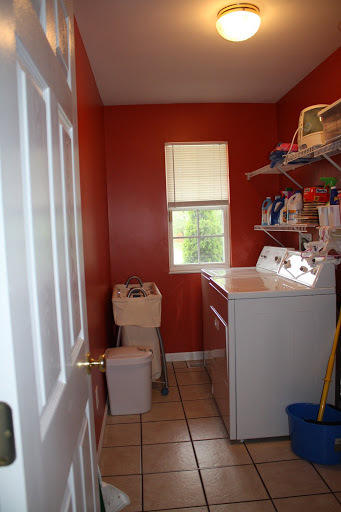 looking good!i don't think i've ever even seen your laundry room at all! wow, I am super impressed!!! Great work! It's crazy how fast things can just pile up…it happens frequently in my house. Our "crazy" spot is my bedroom though…things just get put in there because they have no where to go and before I know it I'm surrounded. 🙂 Looks great! I can't believe how good it looks. I am very impressed. I guess you don't need me to come down for a few days now to help out. I have a great idea! Why don't you come up here and help me get organized? Great job, Heather!